Please Listen "Winged Hope" by Gustaf Grefberg from the videogame "Brothers: A Tale of Two Sons"
this embodies every mysterie of Ashoka Tano just perfectly. 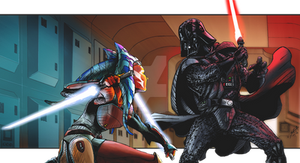 I never forget this metamorphosis that the Sister did with Ahsoka.. it has such a deep, impactfully meaning. Ahsoka IS the sister. In fact, her soul is bound to hers through the force. For the art, Ahsoka is a spiritual animal to me and also lives in a very special place to me. To see others using their talents to bring what we feel inside out for the world to see makes us feel, more or less, recognized. that's exactly what I tought after seeing the owl. Besides, at the end of mistery of Choppes base there is the same owl and in the final shot you can see it very closely and my first tought was "it actually resembles the Daughter". then the next episode only cemented my idea. I have this crazy theory for which she actually died on Mortis but the life force of the Daughter inside her revived her in the end, thus explaining why Vader would leave her there alive. He thinks she is dead!!! That would be awesome!!! Nice drawning bro!!! I LOVE this painting! I entertain the idea that Ahsoka is forever connected to the Daughter in the same way Yue is connected to the Moon spirit in Avatar! You will not beleive when I say this allegory is so close to the text I wrote April 1, 2016... But this is the fact. Thank you so much! This is very beautiful. Good job! Holy frik Is that the light side force girl holding Ashoka. I thought the daughter was dead, and that she gave her life to save Ashoka. I didn't even notice that Vader's in the background!